Readers of this blog may remember the show of Digital Art in the Petaluma Art Center, curated in part by my neighbors, Don and Era Farnsworth, who run Magnolia Editions, an atelier in West Oakland. 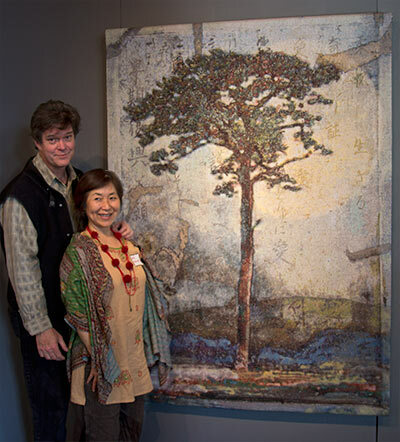 Here is a picture of them in front of one of their splendid tapestries. In addition to being fine artists in their own right, they work and collaborate with many of the art luminaries of these times — Chuck Close, Hung Liu, Kiki Smith, Squeak Carnwath, Enrique Chagoya, William Wiley, and many more. As a consequence they have many opportunities to visit and participate in major exhibitions all over Europe, Japan, and more. Right now they are in St. Petersburg. Great post, and that tapestry looks truly impressive. Tapestries always impress me as they can take forever to do! In the Farnsworth case, huge amounts of time are spent in getting the digital file ready and coordinated with the weavers in Belgium.